My personal journal nor this blog has yet to be a place where I can unload about the saddening event that took place on September 6th. It’s all so fresh that I haven't the words to put both my thoughts and the circumstances together. Conversely, to find the purpose in it (that‘s God‘s thing). Or cope with the truth that it was unavoidable. Personal guilt is somewhere stained in the equation also, though divinely speaking it‘s considered too toxic to muddle over. Nonetheless, the grief involved is real, just as the insurmountable faith I have that all is happening for a higher good. Understandably, much of what I just wrote may be vague and opaque to some, so one day I'll be able to share it properly. 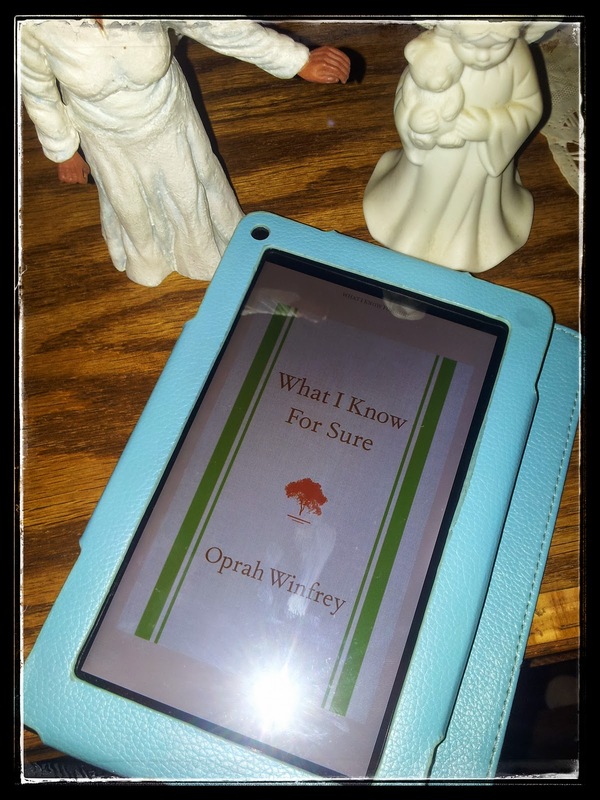 The fact is that after a slow week filled with roaming thoughts and bouts of sorrow, I turned to Oprah Winfrey's recently released What I Know for Sure for comfort. I didn't pick it up to cope per se, as that’s something that takes time and time alone. No substitutes. Nonetheless, I picked the book up to re-energize my spirit as I coped. To not go too deep into the darkness, and to understand that I still have a responsibility to myself (and the one that’s gone but not gone), to keep showing up to Life. What I Know for Sure is a collection of Oprah’s revelations regarding Life and living within it. It shares the mistakes she’s made, the lessons she’s learned, and the Truths she’s kept. All the essays were previously published in O, The Oprah Magazine. I just wanted to share a few of my favorite quotes. Or as Oprah calls them, “aha moments." "You can either waltz boldly onto the stage of life and live the way you know your spirit is nudging you to, or you can sit quietly by the wall, receding into the shadows of fear and self-doubt." This is what I mean by showing up to Life. You may not waltz boldly into it, but dammit, you got to at least be there and out of the shadows. Maybe sticking out a foot is all you need to get started. And definitely don't be afraid to try even when you don't have any answers or securities. Matter-of-fact, forget those things. Have faith that they'll come to you as you dance. Because they will. "Like me, you might have experienced things that caused you to deem yourself unworthy. I know for sure that healing the wounds of the past is one of the biggest and most worthwhile challenges of life. It's important to know when and how you were programmed, so you can change the program. And doing so is your responsibility, no one else's. There is one irrefutable law of the universe: We are each responsible for our own life." While I understand that I still have childhood (and so forth) imprints and issues that require a level of therapeutic and spiritual healing (as you can see, I'm working on the spiritual part), the older I get the more I understand that I can't blame my past for my current being. It really just gets exhausting after so long, thinking about the things my mother and father did or did not do that I feel would've made things easy for me now. Or relate those incidents to how I would be in a better place currently. They are tired and useless thoughts, and they won't necessarily go away. However, what they have done is encourage me to take control–as much as possible–of my life. Recently, my mom and I were leaving the mall. I brought up a broccoli, rice and cheese casserole recipe I found online, and how I made the dish twice in the past two months and enjoyed it both times. I further mentioned how I try to make large dishes early in the week, so that I can have something to eat off of throughout each day. This keeps me from spending money eating out after I leave work in the afternoon, as I find it comforting to know that ready-made food is in the house and ready to be devoured. Her reply was the equivalent of how smart of an idea that is. Then she added how my sister frequently complains that she never has anything to eat, and how it's our mom's fault because she didn't teach us how to cook. I can attest that while that is more or less truth, I recall that I got cooking pointers a lot less often than my sister. But that's my point; I looked at my situation and took responsibility for it. If I wanted to eat and save money from dining out, I had to find a way to do so. Blaming someone else for otherwise never even crossed my mind. "One of my greatest lessons has been to fully understand that what looks like a dark patch in the quest for success is the universe pointing you in a new direction. Anything can be a miracle, a blessing, an opportunity if you choose to see it that way. Had I not been demoted from my six o'clock anchor post in Baltimore back in 1977, the talk show gig would never have happened when it did." I don't lie when I say that the message behind this quote is one that I'm still working on. I believe I'm a lot closer to its realization than the lost and frustrated person I once was. Nonetheless, it's still something I'm working with. The truth is that I grasp the occasional moments of clarity where I feel the universe at work. Sometimes they're obvious moments, sometimes they're so subtle that I don't comprehend what happens until after the fact. Even so, between all of those moments are the moments where I feel like I'm just floating and alone in uncertainty. However, what I've learned is whenever I feel like the universe has abandoned me, I take myself back to gratitude. You absolutely cannot miss your miracles and blessings when you sit back and recall what's there to be thankful for. As well as how gratitude always brings you more to be grateful for. "Talking with thousands of people over the years has shown me that there's one desire we all share: We want to feel valued. Whether you're a mother in Topeka or a businesswoman in Philadelphia, each of us, at our core, longs to be loved, needed, understood, affirmed–to have intimate connections that leave us feeling more alive and human." True enough, right? No further discussion necessary other than I believe in this, and like thousands, long for the same. "... The job that you admit makes you miserable demands so much of your time. But what happens when you work hard at something unfulfilling? It drains your spirit. It robs you of your life force. You end up depleted, depressed, and angry." "I've learned that the more stressful and chaotic things are on the outside, the calmer you need to get on the inside. It's the only way you can connect with where your spirit is leading you." All of this I've known since I started my first paying job at 18. It was fast food. It was slinging fried chicken. For three years I screamed for release–for change. I knew that if I wanted money, I had to be there to earn a check. So I worked, and always harder than I should (I attributed that to my upbringing). When it comes to how jobs ("just over broke") make me feel disconnected and sometimes sick to my stomach, nothing has changed from then and now. Sure, I've learned to handle my inner self a little better. Sometimes putting myself damn near catatonic during the middle of a shift. It's a way for me to slip out of the place and into my head and where I will to be. Often I sing out loud, which usually comes out as noise used to depressurize the anxiety that builds in my chest. Still, it's partly no different than a tiger trapped in a cage, enclosed from his nature and natural instinct to be free at doing what he wills. Nonetheless, my point is that I relate and identify with Oprah's words here. I should, considering I've lived and fought my way through them long enough. Nevertheless, to me, the fact that I can write all of this down–in this moment–is a means of me listening to my inner calmness and not the chaos. Therefore, I am guided slowly... from my cage. "Move in the direction of your goal with all the force and verve you can muster–and then let go, releasing your plan to the Power that's bigger than yourself and allowing your dream to unfold as its own masterpiece. Dream big–very big. Work hard–very hard. And after you've done all you can, fully surrender to the Power." I think I'll leave this post on this quote–though there are plenty more to share. Nevertheless, it's that "surrender" that took me from where I was two years ago to this point. And the thought of it was motivated by this inspirational video I came across during that period. I won't speak to much on it. You'll just have to watch it for yourself and let it lift your spirit just as it did mine.